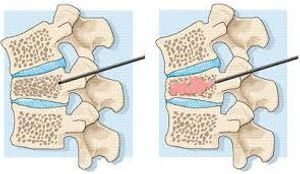 Vertebroplasty is known to be a safe and effective treatment for osteoporotic vertebral fractures. Osteoporosis patients remain susceptible to new fractures, which often occur in the contiguous vertebra to an existing fracture. The large-scale study shows that vertebroplasty does not increase the risk of fracture in the level contiguous to previously treated vertebra and that these new fractures occur at the same rate as they would in osteoporosis patients who did not have vertebroplasty. Long-term data show vertebroplasty for osteoporotic spinal fractures provides dramatic pain relief. The use of vertebroplasty - an interventional radiology treatment for vertebral compression fractures provides dramatic pain relief and sustained benefit. Vertebroplasty, the injection of medical-grade bone cement into a fractured vertebra, shores up the fracture similar to an internal cast and provides pain relief. It is indicated for painful vertebral compression fractures that fail to respond to conventional medical therapy, such as minimal or no pain relief with analgesics or narcotic doses that are intolerable. Many osteoporosis patients with compression fractures are in terrible pain and have a greatly diminished ability to perform basic daily activities, such as dressing themselves. We are recently carrying out stem cell therapy for spine injuries leading to Paraplegia & Quadriplegia.